The Needles, enormous 100-feet (30-metre) high chalk and flint stacks off the most westerly point of the Isle of Wight, are part of the Island’s iconography, and one of Britain’s most recognisable coastal features. They are an exposed eroded section of a folded east-west band of chalk running through the Island, the remains of which continue under the sea toward the Dorset coast, to which the Island was joined until finally being separated from the mainland about 7,000 years ago. There’s a gap for a missing fourth needle, the most needle-like of them all, a 120-feet pinnacle known as ‘Lot’s Wife’ whose spectacular collapse during a massive storm in 1764 is said to have been heard, or felt, in Portsmouth about 20 miles away. The theologians among you will know that Lot’s Wife was turned into a pillar of salt for looking back on the destruction of Sodom when she shouldn’t have (Genesis 19:26); subsequently, Mrs Lot seems to have had her memory randomly applied to geographical features considered worthy of it, including one in Marsden Bay, Tyne & Wear. 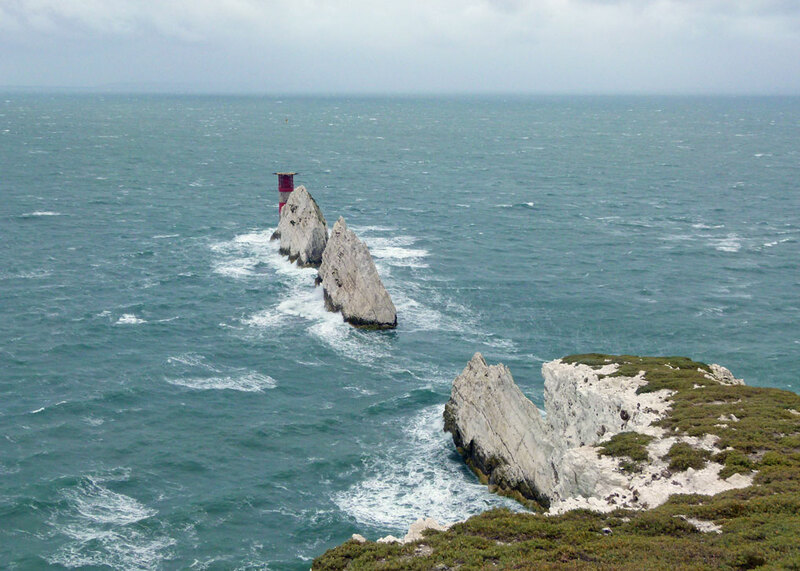 Anyway – beyond the Needles lies the Shingles, a 3-mile constantly shifting bank of pebbles which occasionally rises out of the sea, but which normally lies treacherously just below the surface. 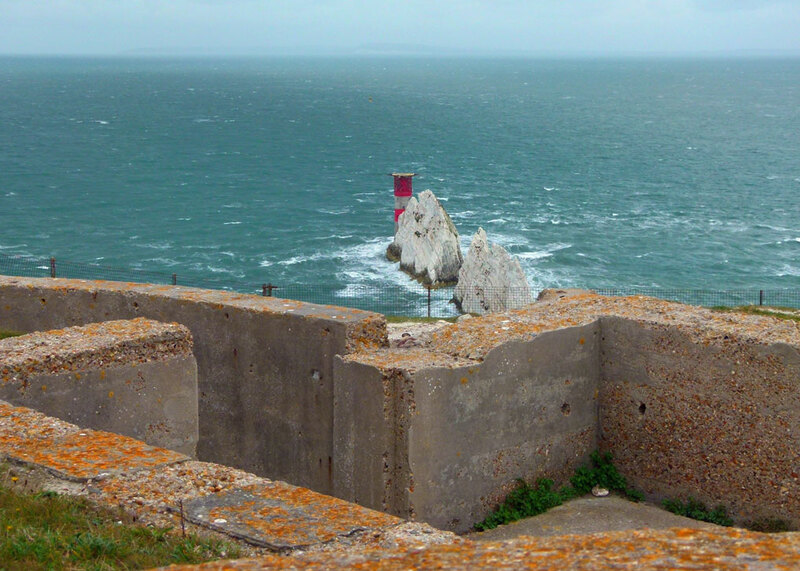 Understandably, the relatively narrow channel between the Needles and the Shingles is treated with respect by sailors. It is a place for wrecks. The Assurance, a 44-gun frigate sailing from Jamaica to Portsmouth, was lost in 1753, and HMS Pomone, en route from Istanbul, struck the Needles in 1811. 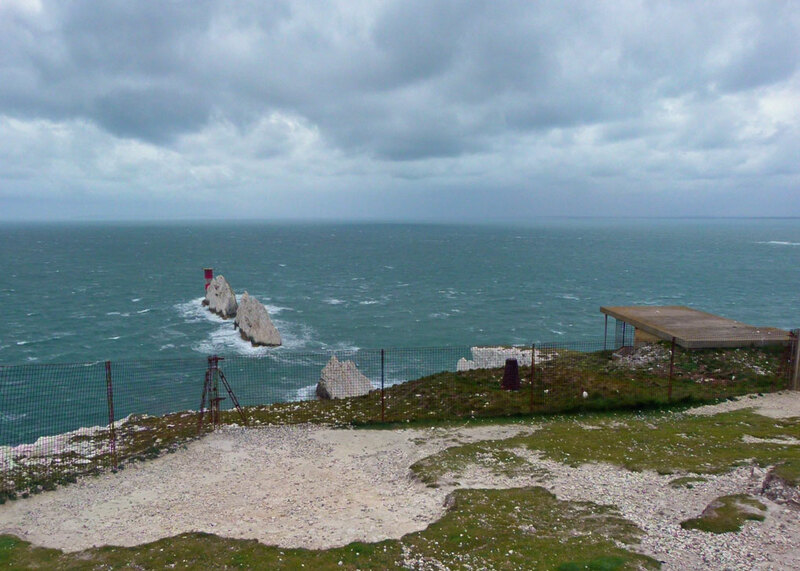 The Needles lighthouse was built in 1859, replacing lights mounted on the nearby cliff-tops. In 1918, two ships were sunk in the vicinity, not by hazardous seas and rocks, but by the deadly torpedoes of a German submarine, UB-35, commanded by Oberleutnant Karl Stöter. On 20 January, UB-35 struck the SS Mechanican, which settled and was swallowed by the shifting stones of the Shingles; on 22 January, the U-boat hit SS Serrana, which broke her back on the Needles ledge. UB-35 was herself sunk by the Royal Navy off Calais on 26 January, with the loss of all hands (having accounted for 42 ships sunk and 4 captured during her career). But perhaps the most famous wreck off the Needles, whose remains are still a danger to other vessels, is that of the Greek cargo ship, Varvassi. Varvassi ran aground with a cargo of Algerian wine and tangerines on 5 January 1947; fortunately, all the crew – not forgetting the ship’s cat – were rescued. If you’re not a sailor and want to see the Needles for yourself, one option is to visit the adjacent, brash, cliff-top eyesore, Needles Pleasure Park. 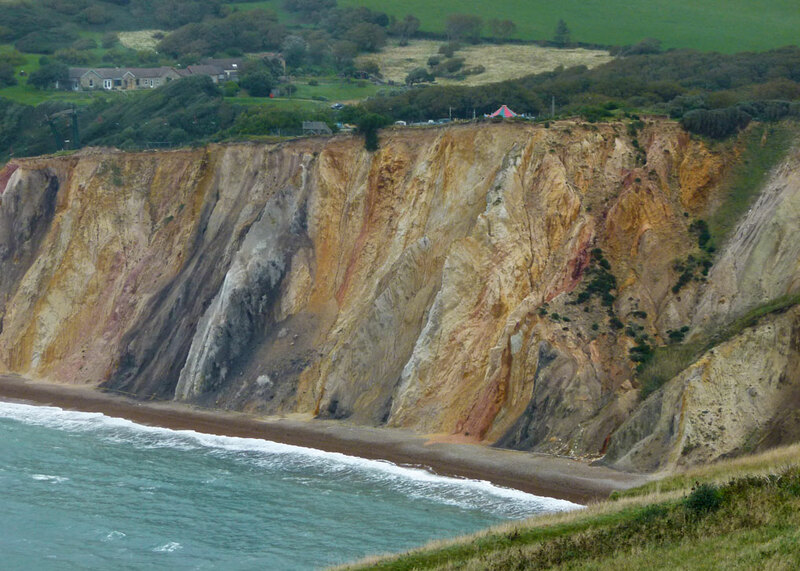 Among other compelling attractions is a chairlift ride (the view must be amazing) to the beach below in Alum Bay, famous for its 21 different coloured shades of sand. 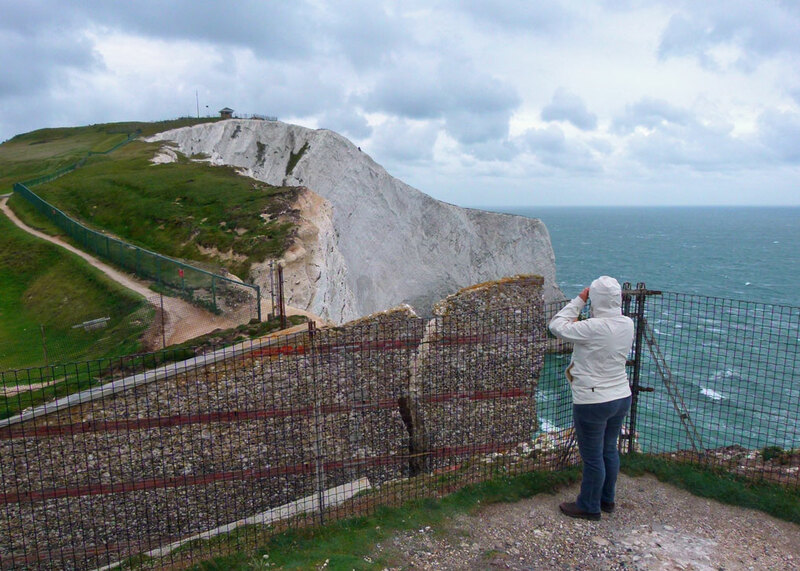 From Alum Bay, you can take a boat ride to see the famous landmark up close and personal, as it were; weather permitting. 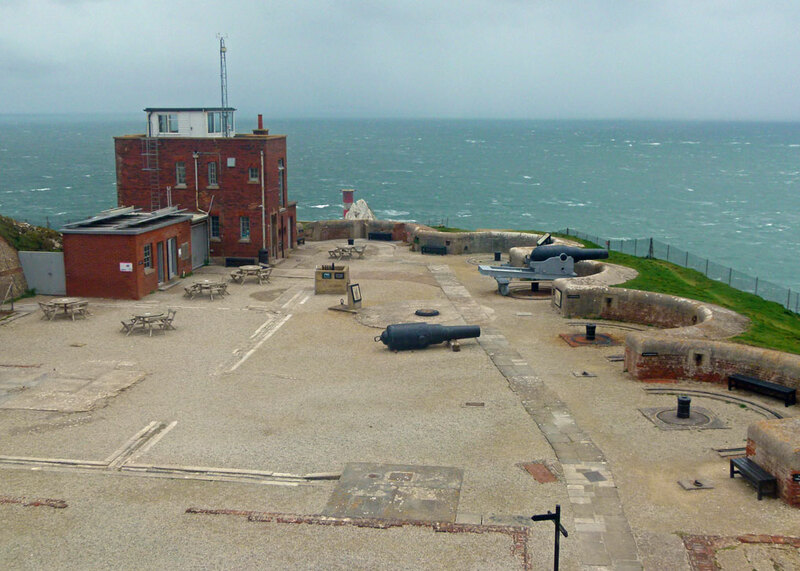 Another option is to visit the Old Needles Battery, one of several Victorian coastal defences built to help defend the south coast, the naval base at Portsmouth and the commercial port of Southampton, against attacks from the dastardly French. Before we do that, we should mention that Guglielmo Marconi undertook some of his pioneering work in wireless communication whilst staying at the Royal Needles Hotel above Alum Bay in 1897. The hotel and Marconi’s masts have long disappeared, but there is a Marconi Monument within Needles Park that commemorates the man and the experiments he carried out that formed the basis for today’s radio and telecommunications. With precipitous chalk cliffs on three sides, the Needles Old Battery had a defensive dry ditch and a retractable drawbridge on its landward side. It was initially equipped with six 7” rifled breach-loading guns, later replaced with six 9” rifled muzzle-loaded guns (designed by Sir William Armstrong, builder of Cragside). It is hard to imagine the place contributing to defending the home shores of a great empire; but it did. The battery’s establishment at time of need was one officer, two NCOs and 21 other ranks; picture them, solemn and full-whiskered, though the battery was not normally fully garrisoned during peacetime. In addition to a barracks for the men, and officers’ quarters, there were magazines, stores, a laboratory and rain-water tanks for a water supply. 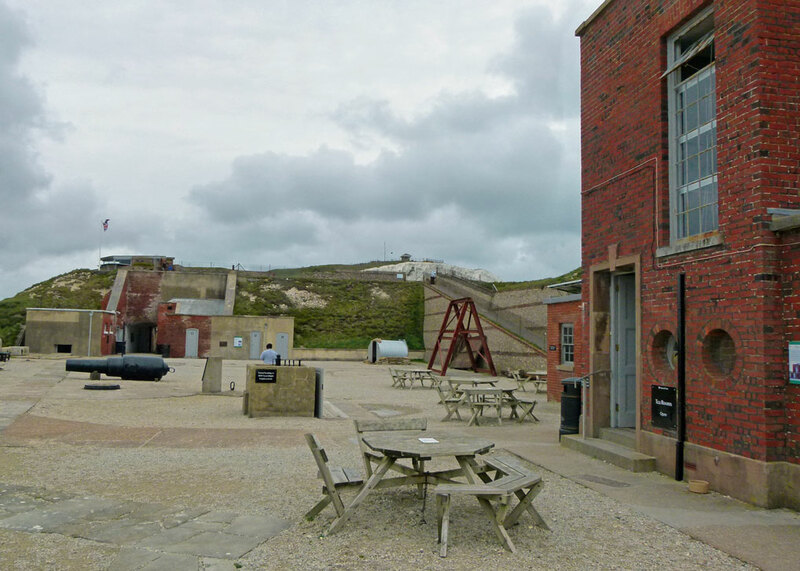 In the 1880s, a lift shaft was dug down to sea level and emplacements constructed for new quick-firing guns to counter modern, fast, motor torpedo boats. 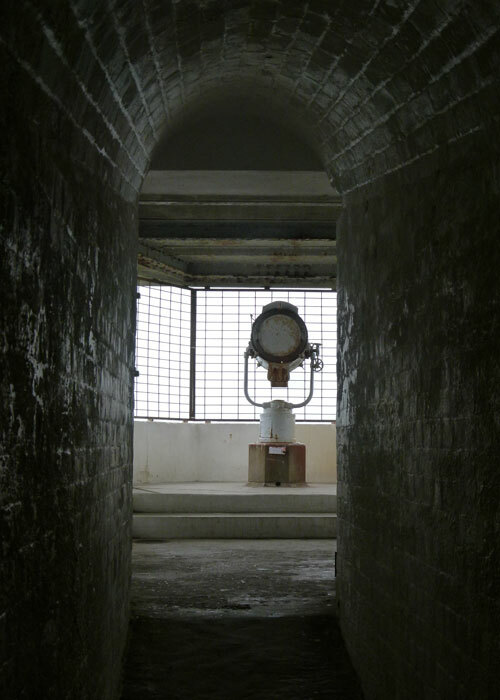 Searchlights were added and, in 1899, a dedicated searchlight emplacement was dug into the cliff above the Needles, accessed via a spiral staircase and tunnel. This now provides probably the best, safest, view of the Needles from the battery. Attempting to photograph the Needles from the exposed ground above proved to be a perilous, nerve-racking, undertaking in the high winds that blew over the headland. Mrs Britain, somewhat smaller, and lighter, than the author, inexplicably moved backwards towards the edge and had to be gently reminded not to stray too far. Afterwards, in the allegedly WW2-themed café housed inside the old brick signal station, where a chunk of extra-dry off-ration NT Victoria sponge was washed down with a cup of mildly coffee-flavoured froth masquerading as a cappuccino, we noticed a board advertising the fact that a Force 8 gale was blowing outside(and partially inside too, by the feel of it). Not the strongest of breezes, to be sure; but strong enough. 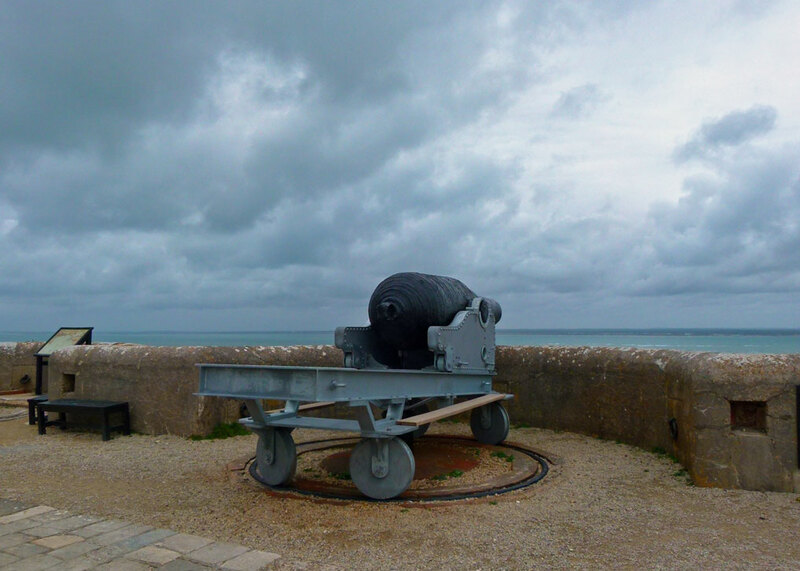 By the 1890s, the old battery was outdated and there was some concern that prolonged exposure to powerful modern guns being fired might bring down the soft chalk cliffs. So, a new Needles battery was constructed on the crest of the headland and equipped with three, modern, breech-loading guns. More buildings followed and the old fort became a fire command post – though, in 1913, Britain’s first anti-aircraft gun was tested on the parade ground. 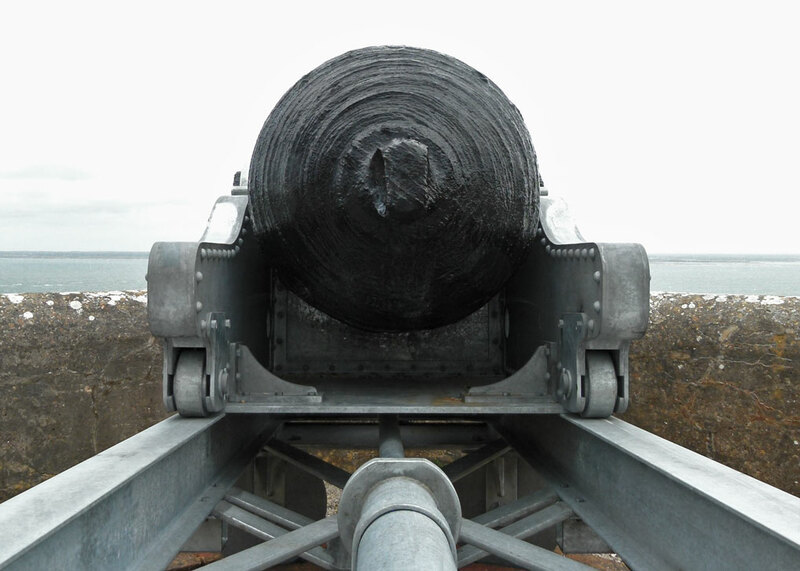 The solution to disposing of the unwanted guns at the Old Battery was straightforward; they were simply pushed over the cliff – though they have been recovered now and two are on display at the fort. 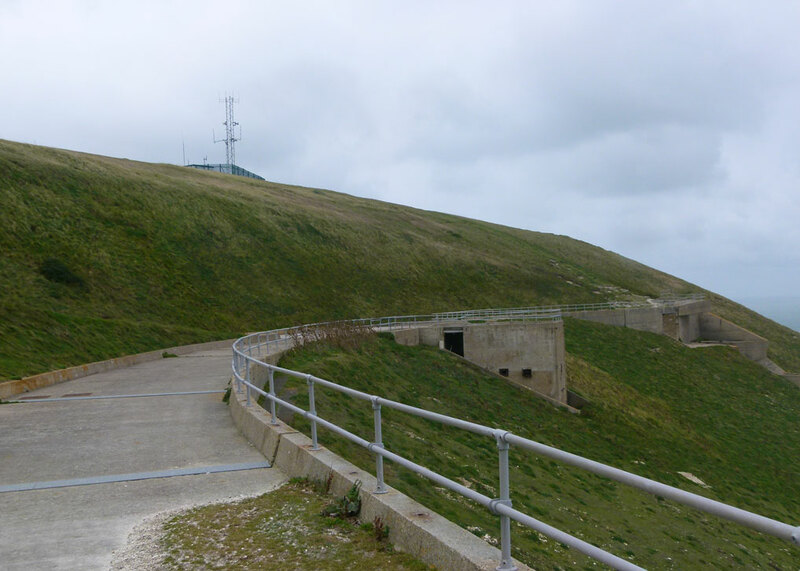 A battery command post was built higher up the hill above the new battery, with clear views over the Solent’s western approaches. It continued as the Battery Commander’s post until after the Second World War and eventually became an electricity sub-station. 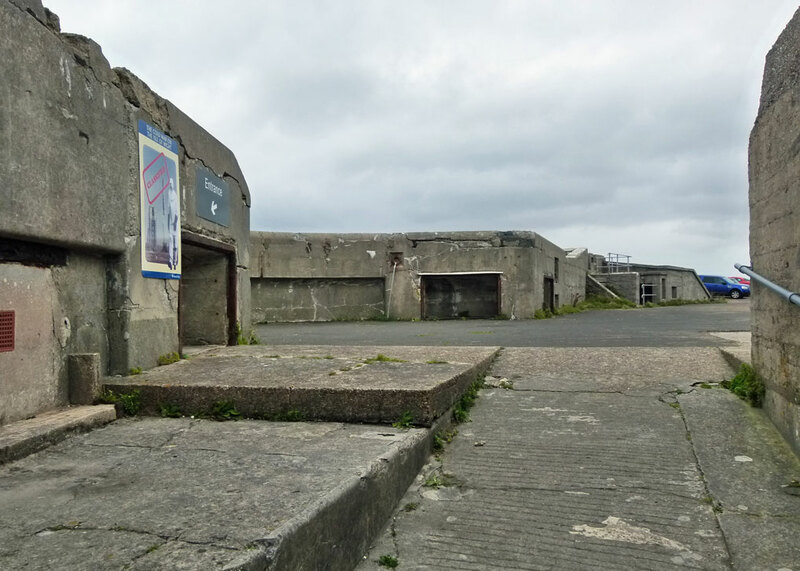 Both batteries were garrisoned during the World Wars, becoming an anti-aircraft site including 3-inch AA, Bofors guns, Lewis machine guns and modern range-finding equipment during World War Two. The purpose was unchanged – to protect the entrance to the Solent and the naval base at Portsmouth from enemy attack – albeit the enemy was different from the one envisaged 80 years before. Steel protective covers were placed above the gun emplacements to offer some protection from hostile aircraft and I imagine all manner of creature comforts for the men stationed there – the latest concrete-padded facilities, by the look of them. What happened next, I confess, took me aback when I heard about it. 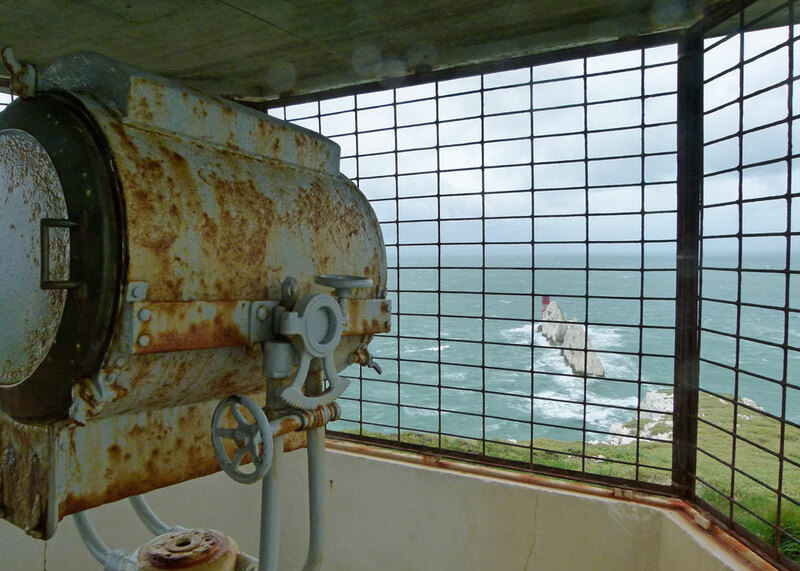 Because, in the aftermath of the Second World War and in the depth of the Cold War with the Soviet Union, the New Needles Battery took on a fresh lease of life as rocket-testing facility. It became known as High Down Test Site and it operated between 1957 and 1971, at one time employing about 240 people. To have such a facility round the corner from major tourist attractions, on the peaceful, sleepy, Isle of Wight and in the heavily populated south-east of England, surprised me – though everywhere has to be somewhere, of course. I suppose it was common knowledge at the time, though I don’t remember it being mentioned on any of my frequent childhood visits to the Island. The best form of security is sometimes the open view approach, and maybe that was the thinking in this case. Now, it reminds me of Ian Fleming’s ‘Moonraker’; I half expected Hugo Drax to emerge from a block of concrete, hotly pursued by James Bond. OK – I know that was based in Kent, but what the heck! The post-war British Government had already decided to develop its own nuclear deterrent and commissioned a missile with a range of about 1,500 miles that could threaten targets such as Moscow. The result was a rocket named ‘Blue Streak’. The next stage was the ‘Black Knight’ project and the New Needles Battery was acquired as a research and development facility for this in 1955, with the first Black Knight rocket test taking place there in April 1957. The rocket’s engines, structures, electronic control and guidance systems, were brought together at High Down for testing as a single system. Rockets were proof-fired (ie fired while fixed to stands) at High Down, before being shipped to the Australian test site at Woomera for launching. 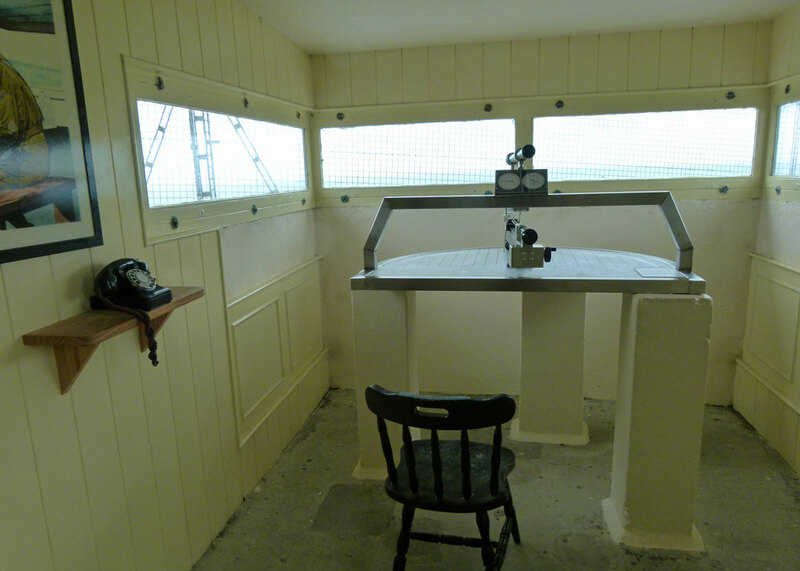 The facilities at High Down were considerable. 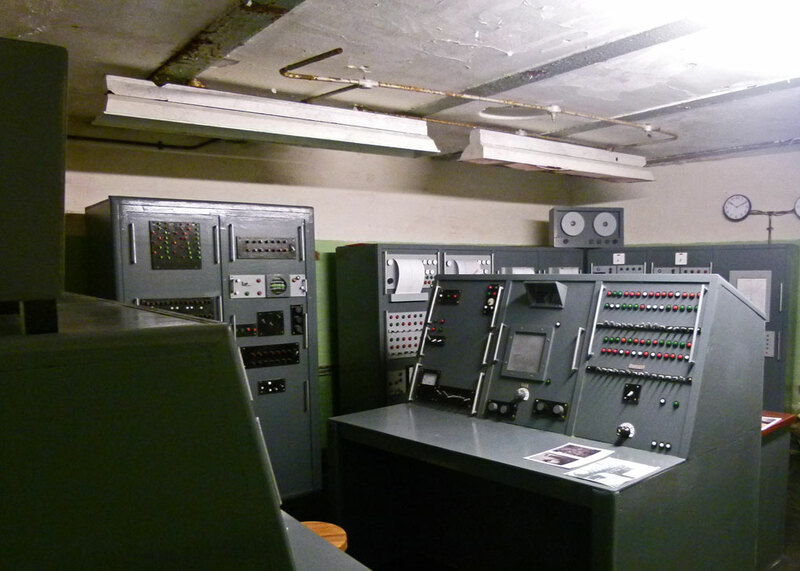 Test equipment needed to be housed in various structures, there was a maintenance building, laboratories, canteens, a kitchen, offices, a conference room, control and monitoring rooms. Two 80 foot-high (24.3 metres) steel gantries held rockets vertically over the firing pit and complex arrangements dealt with gases from the rockets, fuel – and so on. There was a safety bath for workers to plunge into in the event that they became covered in fuel, a reservoir containing water for cooling and fire-fighting. It is hard to imagine all this now – most of the facilities were demolished in the 1970s – though there is a fascinating exhibition on the site. 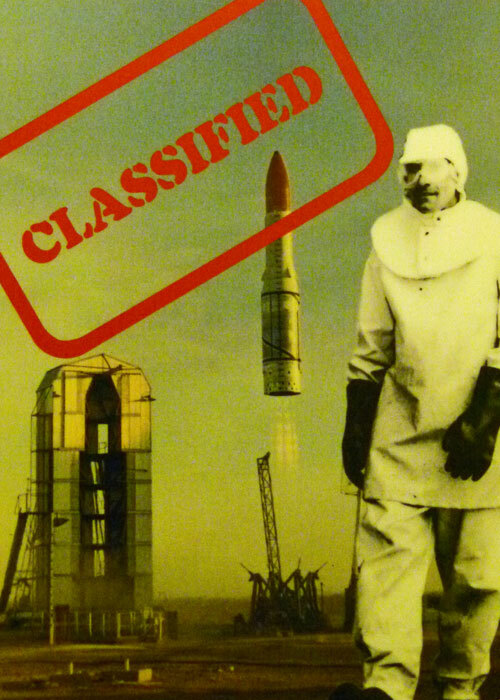 Budgets and altered priorities meant that Britain’s nuclear warhead programme changed course in the 1960s. However, using the technology that created Black Knight, a satellite launcher called ‘Black Arrow’ was developed at High Down, and launched in 1968. On 28 October 1971, Black Arrow carried a satellite, ‘Prospero’, into orbit – the first British satellite successfully launched by a British rocket. However, despite this success, the Government had already ended the Black Arrow programme earlier that year. After various attempts to find other uses for the site, it closed in 1974. Prospero is still up there though, whizzing round in space, and it is said it might still be possible to communicate with it. According to Historic England, the New Battery and High Down Test Site is nationally unique, combining late 19th century fortifications with a Cold War rocket testing site of national significance. All I can say is that the cocktail of historic periods and diverse features at the Needles makes for an interesting – and, yes, unique, visit. I think the variety of heritage and other attractions in Britain will always astonish me. I remember walking up that road towards the rocket testing facility in the dark with my boyfriend at the time, we considered ourselves somewhat hippies in the early 60s, and we drew huge Ban The Bomb symbols on the road with chalk. Reminds me of a school visit about 64 yrs ago. No armaments seen, but I did have the obligatory glass container of sand! My WRAF service later was officially overseas as the IoW was in my area. I remember those glass containers – like test tubes. Love the IoW – many happy memories of holidays there. 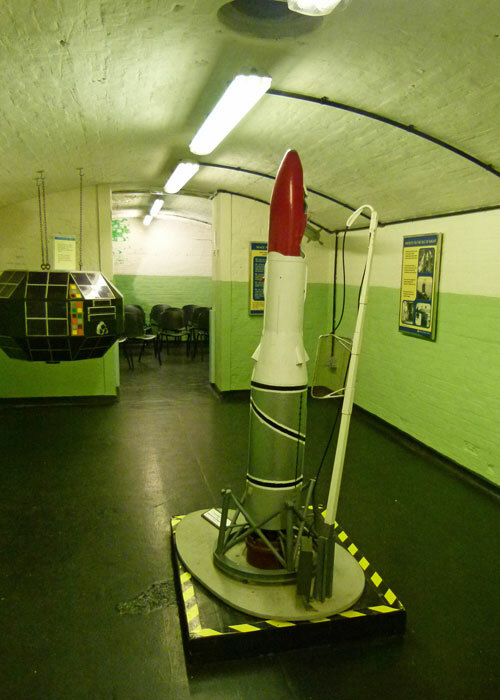 I was surprised that there had been a rocket-testing facility at the Needles Battery but then again, until the 70’s/80’s the country had numerous hush-hush facilities all over the place and successive governments believed that they were necessary for our safety. 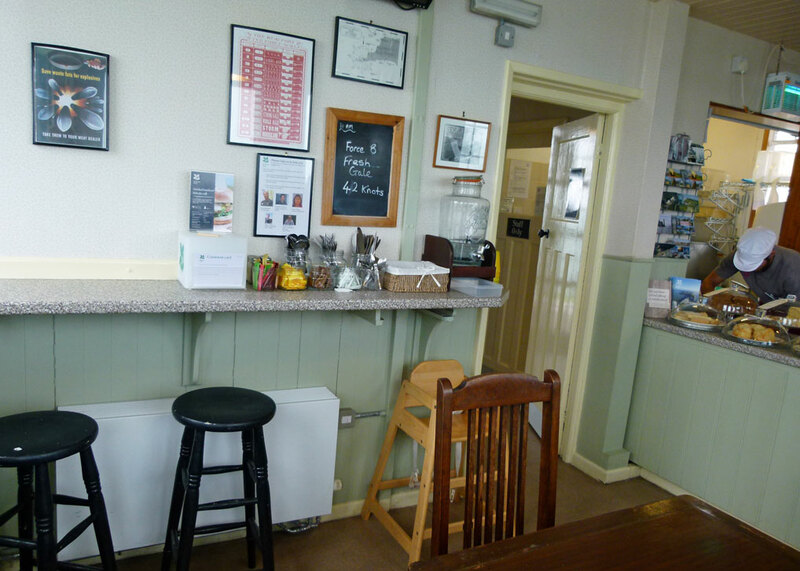 It seemed the café wasn’t up to much on the day you and Mrs B visited! Thanks for another great post, Mike. Yes, you’re right, Clare. It was an exciting day, so food and drink were pretty functional, to be honest! 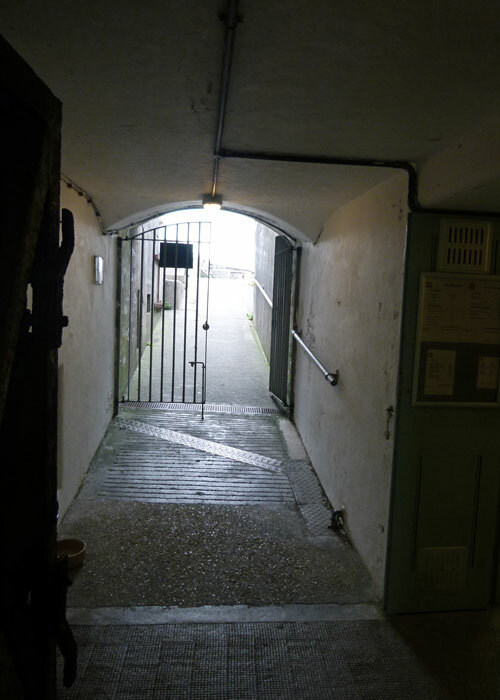 Fascinating it’s amazing what information comes out years later!There was a nuclear bunker in the Nothe Fort in Weymouth and chemical biological warfare tests sprayed over Lyme Bay without the population knowing what was happening. Sarah x.
I think I’ve still got a guitar- shaped glass, filled with coloured sand, which one of the children made on a visit there! Fabulous! I remember they used to sell the sand in test tubes. Thank you, Joanne – I really appreciate that! Fascinating article and awesome photos. What diversity on the little isle of Britain! What a lucky kid you were that you got to see that part of your country so often. This was a fascinating post, Mike! It entertained Mr. C and me almost the entire way home from town. I’m glad Mrs. B didn’t blow away or fall off the edge of a cliff. Although interesting, it sounded cold, windy, and dangerous. I hope the intrepid Mrs B got a nice dinner out after that excursion. I take it that town to home is a relatively short journey…Mrs B liked your comment and has been talking about it ever since. 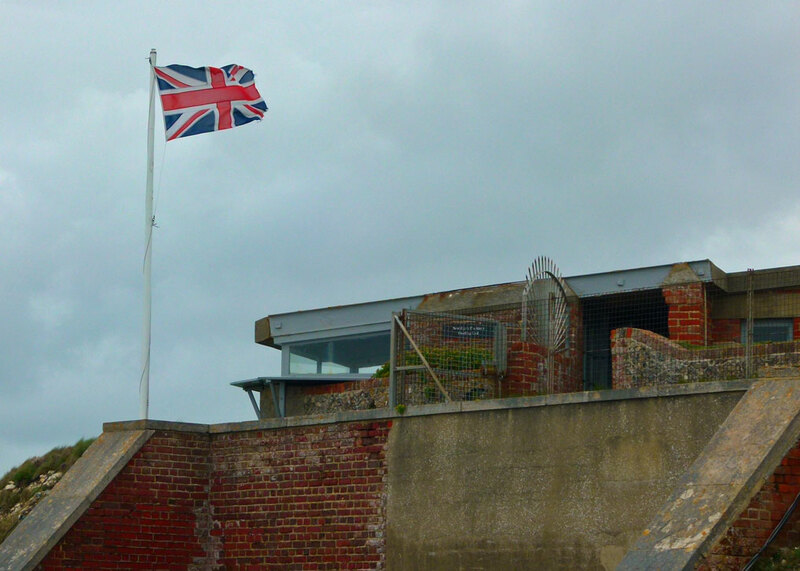 I don’t normally like military architecture and canons, but Hurst Castle was wonderful place to visit. Its location was perfect (protecting Portsmouth and Southampton), the view is still spectacular and there is a ton of green space. Yes, Hurst Castle is on the list for the next time I’m around the New Forest – beautiful there anyway. Apparently according to my hubby, I’ve been there, but have no recollection of it which is slightly worrying. Nevertheless, great post and history. Mrs B reckons I have selective amnesia. A wild and rugged place! I’d enjoy a visit. It was certainly a little restless when we visited. Fascinating. I visited the Isle of Wight once and loved it. Did not explore this part of it though. I think I could live very happily on the Isle of Wight! Wow – a lot of history in that place huh? Looks like a very neat visit – great pictures! One of those places with lots to say for itself! I prefer to see the Needles from a bit further away, ideally from the other side of the Solent.